Every month for a year I’ve challenged you to up your game as a nonfiction writer. Before that, I offered you 52 nonfiction writing prompts. But it’s a new year—and time to switch things up a bit. This year, I want to challenge you to step into your best writing self. What does that mean? I want to challenge you personally to grow and change in ways that support your dream of becoming a nonfiction writer, author, authorpreneur, and blogger. I want to encourage you…push you…personally to change, so you allow or help yourself succeed as a nonfiction writer. I want to challenge you to step into your best writing self. Success means something different for each nonfiction writer. Success could mean earning a living from your writing. Making a living might mean monetizing your books with online courses and coaching programs or publishing enough books and articles to pay all your bills each month. Success could mean getting one book published in the next 12 months. Or it might mean starting a blog and attracting 300 readers per day by the end of the year. I don’t know what success means to you. Here’s what I do know: The only thing between you and success is you. So you need to get out of your own way. How do you do that? With personal growth and personal development. 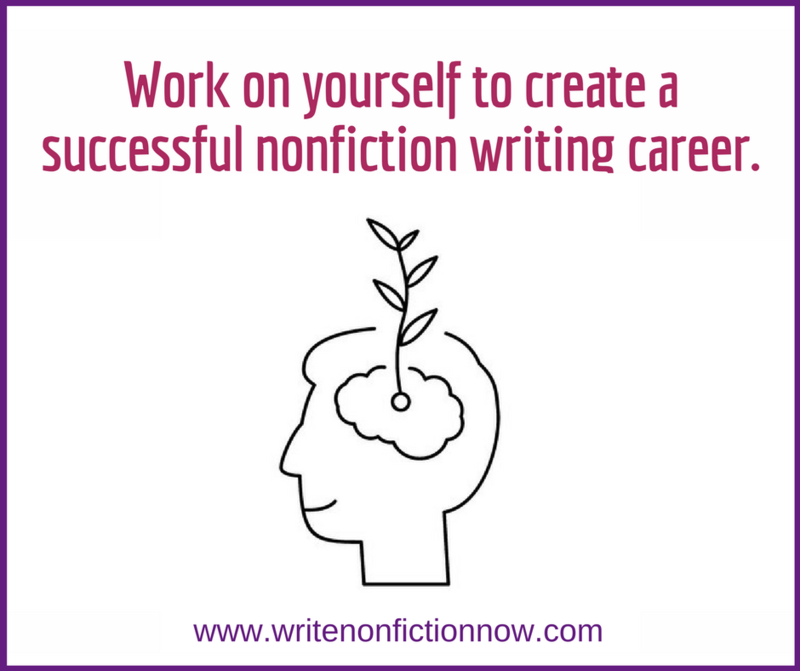 That means working on yourself more than on any other aspect of your nonfiction writing career. Personal change the only way to succeed—at anything. When you change, your results change. The only thing between you and success is you. You have to change. And how you need to change…well, I don’t know that either. Possibly, you need to get more focused. Perhaps, you need to find more clarity. You might need to become more productive or organized. Or you might need to learn how to generate enough energy to write. You might even need to change how you think about your writing or what you believe about your career. Only you know what you need to change. And that’s why the first nonfiction writer’s challenge of the year asks you to determine what you need to change so this year becomes your most successful writing year ever. Here it is: I challenge you during the first week of the New Year to determine the one thing you need to change to increase your level of success. In fact, let’s quantify that. What do you need to change to enable yourself to increase your level of success five times over the level of success you achieved last year? Make a list of the things you know you need to change. For instance, maybe you need to use your calendar more effectively (and block time for writing daily); get more sleep (so you aren’t tired when you try to write); have more tenacity about submitting work (so you submit consistently); or have integrity of word (so you write when you say you are going to write rather than doing something else). Rank each item on the list on a scale of 1 to 10. If you rank getting more sleep as a 1, for instance, sleep will not make much difference in your level of success. If you rate it a 9 or a 10, it will make a huge difference in your ability to succeed in the next 12 months. Review your ranking and choose the one thing you need to change that will have the most significant impact on your ability to change—one you rank an 8, 9, or 10, for instance. Block out time daily first thing in the morning (from 7–8 a.m.) six days a week for writing. Set my alarm to get up at 6:30 a.m. on writing days. Set my alarm to go to sleep an hour earlier every night (to make it easier to get up and be prepared to write). Prepare whatever I need for my writing periods the day before. Only write during these time blocks (do not edit or research). The only way to change is to do something differently. The only way to change is to do something differently. Changing your mindset takes a different list of to-do items than getting up earlier every day to write. But you still need to change. If you don’t change, nothing else will either. That means your level of success as a nonfiction writer won’t change either. Begin the year with the goal of changing something…anything…that will help you succeed as a nonfiction writer. But don’t just set the goal. Plan out how you will change your behavior, mindset, habits, strategies, or ways of operating. The take action on that goal—every day. And don’t let yourself off the hook. That’s how you change. That’s how you will 5X your nonfiction writing success in the New Year…or anytime. Let me know what you plan to change in a comment below. And share how that change will help you achieve a higher level of success in the New Year. For more information on setting goals and creating a plan to achieve them, join the Nonfiction Writers’ University (NFWU). During January, all the NFWU events will revolve around this topic. As the year progresses, I will provide a variety of resources to help you achieve your goals. You can join the Nonfiction Writers’ University for a $1 trial period of 30 days*! When you do, you get access to four years of great content housed in the NFWU as well as monthly educational events, virtual writing sessions, group coaching, and video trainings. *After the 30-day trial period you will be charged $37 per month for NWU membership until you cancel. Practical information and guidance. Thanks!